Want to take your glamping experience to new heights? Meet Sheldon Chalet, the new boutique hotel that just opened on Denali Mountain, the tallest peak in North America. 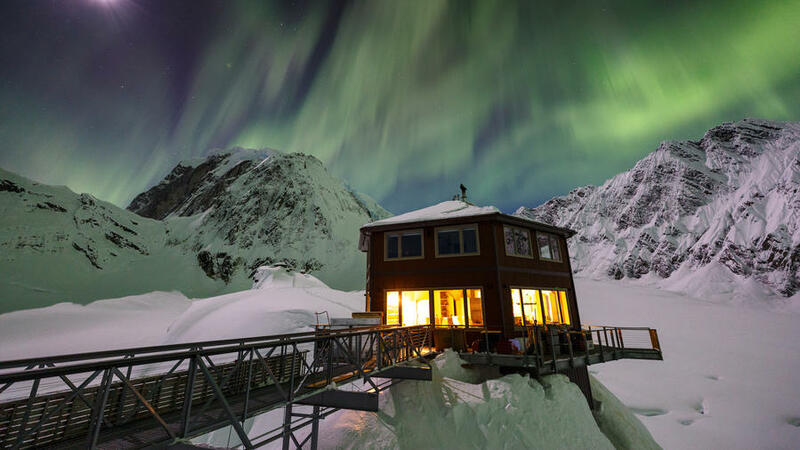 The five-room property is the first and only luxury hotel within Alaska’s Denali National Park, and is an engineer’s dream, artfully anchored onto the face of the mountain, 6,000 feet above sea level. Co-owners and siblings Kate and Robert Sheldon (along with Robert’s wife, Marne), have spent years securing permits and designing and building the property, which was a longtime dream of their parents’, Alaskan homesteaders Don and Roberta Sheldon, who were among the first to pioneer the area in the 1950s. Decades later, the region is still blissfully remote—so much so, in fact, that visitors to the 10-guest bungalow have to be helicoptered in. Don’t let the isolation scare you: the Sheldon team have created a vacation paradise where there’s plenty to do, including guided glacier treks, heli-skiing adventures, and helicopter picnics. They also designed the hotel with the view in mind—wraparound windows and an observation deck offer stunning panoramas of massive glaciers, snowy peaks, and the magical northern lights. The all-inclusive experience also promises chef-prepared meals of the freshest Alaskan seafood, fireside champagne in the cozy common room, and roundtrip travel (via helicopter) to the nearest town, Talkeetna.